Simplicity in design and ease of maintenance are key features of the centrifugal, diffuser type pumps. 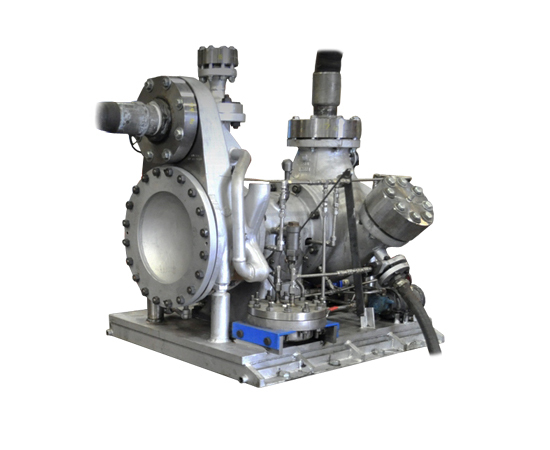 Coffin Turbo Pumps designs are close coupled as steam turbine and pump are mounted together on one single rigid shaft eliminating alignment issues, temperature differentials and delay in start-up time. Please find all the specifications on steam driven Coffin Turbo Pump below. Boiler Feed Pumps (BFP) are an essential part of a steam turbine power plant. BFP re-deliver water received from the condenser back to the boiler. A constant flow of circulating feed water is essential for boiler operations and steam generation. In general BFP service and operating conditions are critical and challenging: high pressure application, high delivery head, high or low flow rates and water temperature, varying load and power plants process-interruptions are common denominators. Steam driven Coffin Turbo Pumps close-coupled design ensures complete integration and compatibility of turbine driver and pump-end via a single shaft at the heart of rotating and stationary components. Ensuring that it is better suited for the challenges faced by BFP.